The 65CR852 is packed with features, boasts a brilliant operating system, and wears its curved design nicely. However, while Panasonic's curved screen debutante delivers 4K UHD pictures of exceptional detail and subtlety thanks to the talents of its 4K Pro video processing system, these talents are undermined by some backlight issues not found on Panasonic's equivalently specified flat TVs. It's been a while coming but the Panasonic TX-65CR852 is the company's first curved 4K screen. 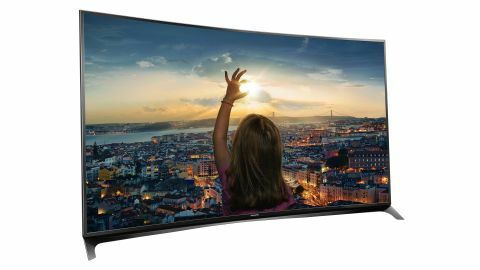 While other TV brands have yet to embrace the curve as fully as Samsung, apparently brisk curved TV sales mean rivals are now feeling obliged to include at least one or two curved models in their latest ranges. I recently tested Sony's latest curved model, the 65S8505C, and now my test bench is heaving under the weight of Panasonic's debut curved TV, the hulking 65-inch brute known as the TX-65CR852. Actually, describing it as a hulking brute isn't entirely fair, as Panasonic has managed to wrap its curved debutante in a very trim frame and tried to hide the desktop stand by curving it back from the screen's bottom corners. But still, while many people find curved TVs more attractive than flat ones there's no denying that they make more of an impact on your living room - especially if you're wall hanging them. There is one thing I should point out about the 65CR852's unusual rear-curving desktop stand. The way it attaches to the extreme right and left corners of the screen means you need to rest it on a piece of furniture that's at least as wide as the TV. Otherwise the TV will just fall face down on the floor. Ouch. The 65CR852's connections are hit and miss. On the hit side of things, the TV carries three USBs and - very usefully - an SD card slot for playback of multimedia files. There's also built-in Wi-Fi for accessing streamed media from networked DLNA-enabled devices or accessing Panasonic's walled garden of online content. The miss part is the provision of just three HDMIs when most high-end TVs these days offer four. To handle the many different content sources now available on modern smart TVs, Panasonic has this year worked with Mozilla to develop a version of the Firefox operating system designed specifically for TVs. Fears that such a 'co-production' may have lead to another system as heavy handed and long-winded as the new Android TV system, sported by the latest Sony and Philips TVs, are quickly squashed. The Firefox engine turns out to be brilliantly simple and slick - as well as almost infinitely customisable. The Firefox interface is ruthlessly efficient and logical in its structure and presentation, and also provides attractive and slick access to most of the key smart TV apps. There are the 4K versions of both Netflix and Amazon, for instance, while the BBC iPlayer, ITV Player, All 4 and Demand 5 catch-up TV apps are provided via a new Freeview Play app. While the Firefox engine is undoubtedly handy, though, it's not the TV's most important feature. That, of course, is its picture quality, as defined by its glamorous combination of a curved screen, a native 4K UHD resolution, and Panasonic's 4K Pro video processing engine. The 4K Pro system extends its tentacles into just about every aspect of TV picture quality. Particularly noteworthy is the 3D Lookup Table it uses for its colour reproduction. Only available in previous years on professional-grade monitors, these lookup tables should enable the 65CR852 to reproduce a much wider and more nuanced range of colours than most TVs. The 4K Pro engine also claims to use advanced light control techniques (in conjunction with a direct LED lighting system driven by a local dimming engine to boost contrast) adapted from Panasonic's plasma days to deliver more shadow detail in dark areas. Plus a combination of raw power and advanced picture algorithms are also reckoned to help the 65CR852 deliver superior noise reduction, better upscaling of non-4K sources and cleaner motion playback. The 4K Pro system isn't just focussed on making picture quality generally better. Panasonic is very clear about the fact that 4K Pro has been designed with the intention of making pictures look accurate to their creators' original intentions - which is exactly the sort of thing many serious AV enthusiasts want to hear. One thing the 4K Pro system doesn't provide is any Samsung-like processing adjustment of the image to make them better suited to the curved screen. Though haters of video processing may consider this a strength rather than a weakness, especially as the depth-enhancement system can't be turned off on Samsung's curved TVs. As you would expect of a high-end TV, with such a clearly defined 'enthusiast' market, the 65CR852 is packed to bursting point with calibration features. The list includes colour and white balance management, gamma adjustments, and plenty of options for adjusting the strength of various parts of the video processing system. I couldn't help but notice, though, that the 65CR852 doesn't carry the same THX endorsement and picture presets you get with Panasonic's CX802 flat TVs, making it hard not to think that THX's independent test procedures came across some problem with the 65CR852's curved screen. If you follow the AV world closely, you'll likely have heard that there's yet another big new picture quality feature in town: High Dynamic Range video. HDR content is created with a much wider luminance range than normal video, resulting in a brighter, more contrast-rich picture on TVs that can support it. The 65CR852 can't support it yet, but Panasonic assures me that a firmware update is incoming that will unlock HDR playback on its curved TV. With this in mind it's worth pointing out that the 65CR852 uses a new high-brightness, wide colour phosphor design that should prove helpful in delivering HDR's advantages. The 4K Pro system also includes an element that can make use of the 65CR852's high brightness with non-HDR footage by reintroducing the picture luminance typically lost during the digital video compression process. It would be nice, too, if the screen's supposed brightness advantage helped its built-in active 3D playback system to avoid the dimness often seen with this 3D TV technology - though a combination of apparent public apathy about 3D together with the fact that you don't get any free 3D glasses with the TV mean I'm not sure how many people will ever watch 3D on the 65CR852 anyway.